A "Ghost Whisperer," offering Healing Readings from the Spirits and the Soul, Delivering Messages from Spirit Guides, Inner Child Soul Retrieval through Transpersonal Hypnotherapeutic Techniques, Tuning in to Astrological Input. Clearing Homes of Negative Energy. Rev. Jean, being an experienced international medium, can help intercede with your loved ones who have passed on if they are capable of being reached at the time through conscious mental direct voice from them or by an interceding communication spirit. You can get answers and bring peace and closure. This is not a gimmick; ask for proof that the spirit you are reaching is real. They love, forgive and wish for forgiveness from you when given the chance to communicate. Rev Jean is a lot like James Van Praagh's "ghost whisperer" in that she communicates with "Spirits", and helps them deliver messages to their living friends and family on the earth plane so that they "know" that they are loved. Rev. Jean Holmes, healer, channels for many great spirits including the Chief Red Cloud, honorable Chinese healing master Lee Chow, and Archangel Michael, Archangel Gabriel, and Archangel Raphael. She attempts to link your highest soul's intent to your conscious mind, while healing the causal body and the emotional/physical bodies of blockages, and other obstructions through the use of a transpersonal hypnotherapeutic process… thus creating unity within your whole being. Lee Chow, healer, and Chief Red Cloud spoke through Rev. Jean at the International Federation of Spiritualists International convention in Rhode Island. Some of the most respected international teachers of mediumship and spiritualism in attendance at the conference were very impressed by the manner in which different spirits gave evidence that was very direct and clear. Rev. Jean's intention is absolute accuracy. Her reputation rests on proof and irrefutable evidence provided by her spirit guides. For more information about transpersonal hypnotherapy, retrieving the child of the inner light (the inner child), the higher self, spiritual healing, read "about healing." To order a reading, see "How to Order." We'd like to thank Paola Harris for taking this picture of Standing Elk and Rev. 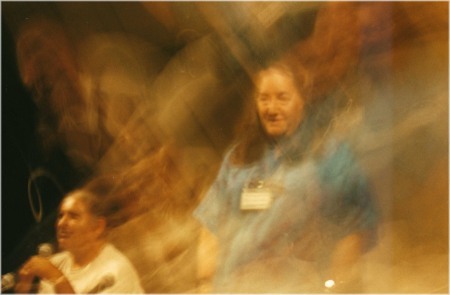 Jean at Fourth International Star Family Conference in Rapid City, South Dakota. The evidence of Red Cloud's formation over Jean and others over Standing Elk is seen during a prayer to the relations. Message from Archangel Gabriel: "If you would only ask us for that which you need, you would give us permission to help deliver it to you. By asking, you give us permission to do what we were created to do. Otherwise, you leave us frustrated." "Potential", unrealized, is like a puff of smoke; it warms no one and illuminates no one." Rev. 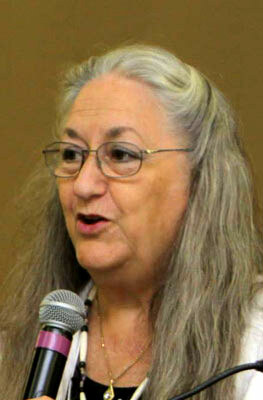 Jean Holmes will be lecturing at 1st Spiritualist Church in San Diego on July 24th, Sunday. And following that will hold a healing message circle with assistance from Rev. Bluewolf and others shortly after a potluck lunch. For more info, contact the church's website. "Thanks for the notice of your 1st radio show with Al Diaz Sun Aug 17th, at 11am pacific. It is so good to hear from you and that others will be able to hear you and the messages you bring. Rev. Jean Holmes is available for Master/Mistress of Ceremonies Services (MC): ​Rev. Jean has a charmingly magnetic personality full of quick-witted humor and laced with extensive knowledge from years of study in many and diverse spiritual fields, including parapsychological study, psychology, comparative religions, and metaphysics. She has been highly praised for her humorous and inspiring speeches as Master of Ceremonies. Rev. Jean has also worked with identifying criminals, and locating runaways, lost children and downed planes similar to the psychic work of Sylvia Browne, James Van Praagh, and John Edward.